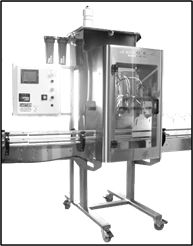 Gravity Fillers dispense product based on the amount of time the nozzles are opened. They are an economical solution for filling thin products at high speeds. Touch screen interface for adjusting timers and parameters make the setup process quick and easy. - Available in 2, 4, or 6 heads. - Accepts bottles from 2 oz to 1 gallon. - Gravity fill operation is accurate with thin liquids. 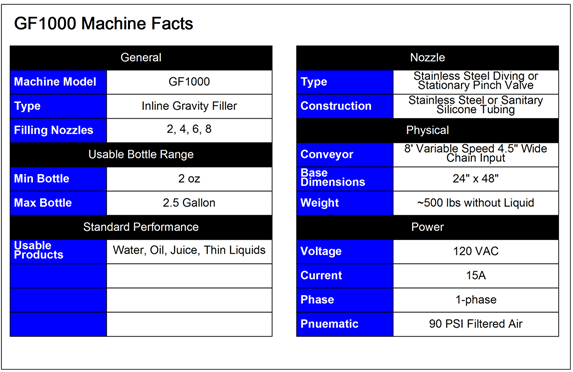 - Nozzles are positive shut-off and are constructed from stainless steel. - Diving Head option available. - Stainless steel outer guard with windows. - Stainless steel Product Tank. - Mechanical Float is standard. - Stainless steel conveyor channel.